This blog details my efforts to create a book in 2013. It contains features such as sneak previews, questionnaires, and writing resources and support. Everyone currently trying to write a book should come join in the community. Writing a book is hard work, you shouldn't go it alone. 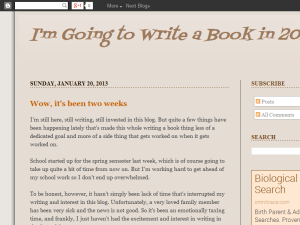 This what your I'm Going to Write a Book in 2013 Blog Ad will look like to visitors! Of course you will want to use keywords and ad targeting to get the most out of your ad campaign! So purchase an ad space today before there all gone! If you are the owner of I'm Going to Write a Book in 2013, or someone who enjoys this blog why not upgrade it to a Featured Listing or Permanent Listing?